Is Facial Acupuncture really effective? And is it better than Botox? As an acupuncturist trained in Mei Zen cosmetic acupuncture, I get asked this question a lot. So I’m going to tell it to you straight. Is it effective? Yes. Is it better than Botox? It depends. Botox is the injection of Botulinum Toxin which is considered the most powerful neurotoxin ever discovered and the most acutely toxic natural substance known. In small doses, it’s thought to be safe, and it can be very effective at freezing the muscles that cause wrinkles. The results are instant and pretty drastic, and typically last 4 months on average. Facial acupuncture (aka cosmetic acupuncture) is a treatment based off of ancient Chinese medicine which involves placing ultra-fine needles at specific points on the face to naturally enhance the look and health of your skin. Because here’s the thing: Our bodies, and our skin, have miraculous built-in mechanisms for repair and renewal. It’s constantly renewing! Unfortunately, the combined assaults of stress, environment, and age can compromise our skin’s ability to keep up with the constant demand for cell renewal. Facial acupuncture fosters and improves your skin’s own natural ability to regenerate itself. Facial acupuncture gives your skin the support it needs to do what it already does best: repair and strengthen itself. Needles as thin as a strand of hair are inserted carefully into specific acupuncture points on the face. We do a LOT of points: points in key muscles to relax tension, points in the lines and wrinkles, points in the hairline to lift and tighten, points to plump…. a lot of points. Along with the face points, body acu-points are also done to balance and boost the skin from the inside out. Which sounds scary, but a skilled acupuncturist can make it so that you honestly hardly feel most of the points. The needles are solid, not hollow like most medical needles, because they’re neither injecting nor removing anything from you. They’re so thin that they’re bendy, can be inserted without even feeling it and can be removed without any bleeding. Once the needles are in, we leave you to relax for about 25 minutes. Most of our patients fall asleep and feel incredibly relaxed. And they walk out glowing. A trained acupuncturist knows the exact needle technique to gently and effectively affect the dermis, this is very specific and important for results. So make sure you’re seeing a trained Mei Zen cosmetic acupuncturist. This micro-trauma to the dermis encourages the skin’s own repairing mechanisms to stimulate cell regrowth, which triggers the body to produce more collagen and elastin and send it to the face. More collagen and elastin in the face leads to fewer wrinkles and smoother, tighter, plumper, glowing skin. Here’s how I like to think of it: you know how weight-lifting creates tiny micro-tears in muscle fibers and your body’s reaction to this is to repair and rebuild the muscles so they get stronger? Basically, the micro-trauma causes your body to send self-healing to the area. In such a manner, facial acupuncture stimulates your body’s natural resources to repair signs of aging. Preliminary research on facial acupuncture is showing promising results. This study illustrated improved facial elasticity with facial acupuncture. This study showed that facial acupuncture has “clinical potential for facial wrinkles and laxity”. However, further large-scale trials are needed. Meanwhile, people and facial acupuncturists all over the world are witnessing and experiencing the visible results. Consistency is key. Treatments are cumulative meaning each appointment has a snowball effect as collagen and blood flow return to the face again and again. To see the best results, treatments are recommended 1 - 2 times a week for five weeks. This allows the body the proper amount of time to repair the dermis and give long-lasting results to the skin. How does facial acupuncture compare to Botox? 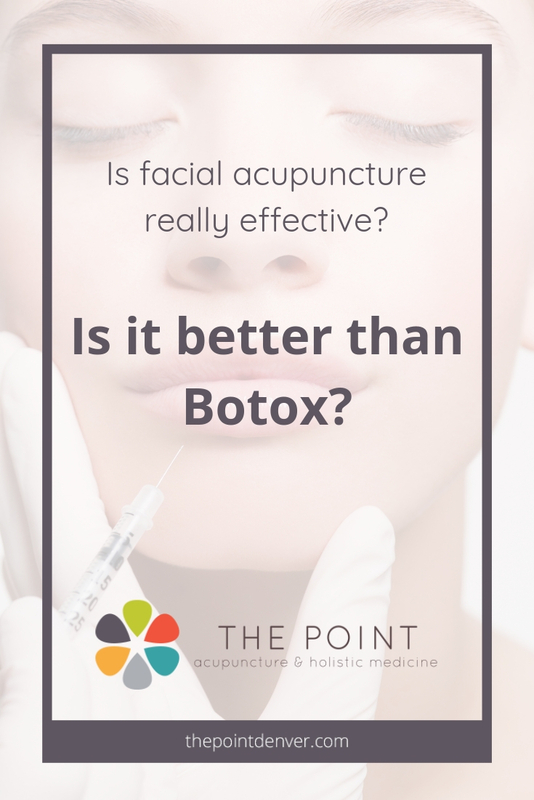 So facial acupuncture is effective, but how does it compare to Botox? In contrast to Botox which paralyzes the muscles that cause wrinkles, with facial acupuncture we’re not freezing the muscles but rather releasing the tension that caused those wrinkles and getting them to work optimally again. You can avoid the “frozen face” of Botox with facial acupuncture. Botox involves a known toxin. It’s thought to be safe. But many people think (I would have to agree) that it hasn’t been in use long enough for us to confirm the safety of its long-term use. Facial acupuncture improves fine lines and wrinkles, plus more. It also has many other benefits. Anti-aging isn’t just about fine lines and wrinkles; it’s also about sagging and puffiness and a duller complexion. Facial acupuncture can help your skin regain its youthful glow and plumpness, it can lift and tone, it can even skin tone and texture, as well as smooth the lines and complexion. So in the acupuncture vs Botox debate, I would say it depends. How comfortable are you with toxins? How comfortable are you with freezing the muscles of your face? Would you like to address more than fine lines and wrinkles? I think it’s a personal decision. Can you do BOTH Botox and Facial Acupuncture? Unfortunately, not at the same time. While acupuncture usually works very well alongside medications…. for depression while you’re on an antidepressant, for migraines when you’re on Imitrex, for knee pain when you’ve had a cortisone shot… totally fine! We acupuncturists are happy to collaborate with doctors. However, in this case we can’t do facial acupuncture if you’ve had Botox recently. Because the needles strongly influence micro-circulation in the area, there’s risk of it causing the Botox to migrate and lead to unwanted muscles being affected. Yikes. So wait at least 4 weeks after a Botox treatment, and then come get your Facial Acupuncture. Facial acupuncture is gaining traction in the beauty world and is being touted as the holistic alternative to Botox for its ability to slow down signs of aging in a more natural way. It harnesses your own body’s innate healing abilities, that’s what I love about it. And that’s what makes it so powerful. What I want you to know is that there are options. You don’t have to go under the knife or the “botox” needle to look and feel your best. Facial acupuncture is a safe, effective, and natural way to help you age and look your best without surgery or chemicals. And you’ll walk out glowing. You can learn more about our Facial Acupuncture services here. 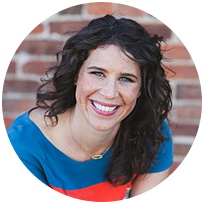 Looking for facial acupuncture in Denver? Contact us today! Absolutely. I should add the price to this blog post, thanks for the heads up. Facial Acupuncture is $150 per visit, and you get your 10th visit free.